The primary objective of the RDN Water Budget Project was to develop a better understanding of the surface and groundwater flow systems within the RDN. See 1. Introduction. All available information was compiled and reviewed – more than 750 reports – and used to construct a comprehensive electronic geodatabase. See 2. Model. Electronic information was used to develop conceptual hydrogeological models for each of the six RDN water regions on Vancouver Island. This information was used to assess the water movement and exchange between various watershed elements including rivers/creeks, lakes, and groundwater aquifers. See 3. Water Budget. The Phase One water budget assessment was an initial attempt to consider the inputs and outputs from the surface water and groundwater systems using existing data on a water region basis. The geodatabase that was developed was used to construct two and three dimensional hydrological and hydrogeological images in order to visualize and understand how surface features and activities relate to subsurface aquifers. The compiled data, in conjunction with water use data developed by the RDN, was used to assess the level of stress on each of the six water regions and 28 mapped aquifers across the Vancouver Island area of the RDN. The following table provides a summary of the results of the conceptual water budget assessments completed as part of the study. Quadra Sand Aquifer 163 located in an isolated pocket in the Cedar area (WR6). Due to the regional nature of the study and the limited monitoring data available only qualitative water budget assessments could be completed at this time. The water budget estimates provide a relative comparison from region to region or aquifer to aquifer, rather than actual values of water availability or water use which are needed for quantitative land use planning and design. In addition, it should also be noted that local issues cannot be fully addressed at the regional scale of assessment and this report should therefore not be relied upon for determining the suitability or future sustainability of new projects or developments with respect to surface water or groundwater supply. More information is needed to refine models and assessments – see 4. Data Gaps. 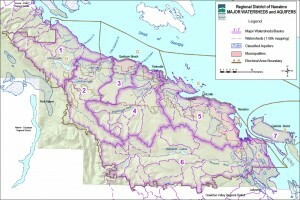 It has been recommended that the RDN select one or two water regions to complete more detailed water budget assessments in accordance to the Ontario Ministry of Natural Resources Tier 1 or Tier 2 level assessment which was used by the consultants as a guide for the Island Water Budget project. This will allow the RDN to further develop the geodatabase for future quantitative water planning in all water regions across the RDN. 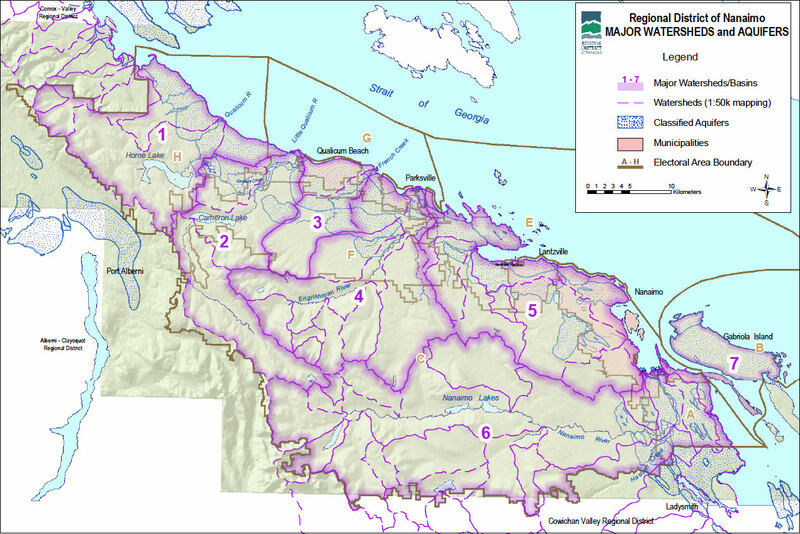 It has also been recommended that the RDN select a water region within the Nanaimo Lowland area so that numerical modelling currently underway by the Geological Survey of Canada can be used to further refine aquifer water budget estimates in this area. Given the stress assessment for both surface and groundwater, the French Creek Water Region may be a suitable candidate for a pilot study which is also recommended. The geodatabase structure developed during this project is intended for use in developing a secure web application where surface water and groundwater information can be made available to the public. This will allow water managers and practitioners to have current and consistent data for use in water and environmental-related projects within the RDN which should allow for the advancement of knowledge with respect to water management and protection. It is anticipated that the web-based user interface would initially be similar to the RDN Water Map where key reports, maps and datasets are made available on-line. As the web interface is further developed, it should be possible for users to upload electronic groundwater and surface water data on-line. The data could include monthly/annual water use, water levels, water chemistry, aquifer properties interpreted from pumping test analysis, cross-sections, time-series data, hyperlinks to raw data, and a geo-referenced copy of any final reports. The RDN will likely need to develop guidelines, policies, and templates for data collection and submission as part of their planning and watershed management initiatives.